Torrent download slow like crawling? With the popularity of post like ways to increase torrent speed, it looks like a lot of users have been facing slow torrents downloading speed using desktop BT or BitTorrent client, as the ISPs (Internet Service Providers) around the world starts deploying traffic packet shaping and bandwidth throttling to severely limit the download speed of P2P programs. A lot of BT client implements protocol encryption (PE), message stream encryption (MSE), protocol header encrypt (PHE) or obfuscation to workaround the ISP restriction by making traffic harder to identify. However, with increasingly advanced and sophisticated measures, obfuscation and encryption have became less effective. The best workaround is to download the torrent’s contents via third-party network, preferably server based. ImageShack Torrent Drive provides such offsite torrent download service. ImageShack Torrent Drive (also known as IS Drive) service is a fast, easy and convenient way of downloading torrents, without the need to install any dedicated desktop BT client. By uploading the .torrent or providing the torrent URL to ImageShack, torrent download is taking place on the ImageShack servers, which is connected to Internet with multiple Tier 1 telecom providers and direct Internet connections. In fact, all sharing and uploading while downloading via BT network is happening on the server side, without utilizing bandwidth on the user’s client side. In fact, user can just turn off the computer while torrent is downloading. Once ImageShack torrent engine finished downloading the files pointed in the torrent, end-user can then log into his or her ImageShack Torrent Drive to download the contents by HTTP protocol. In other words, user can convert to download a torrent by HTTP (normal web browsing connection) indirectly, with torrent downloading service provided by ImageShack servers. 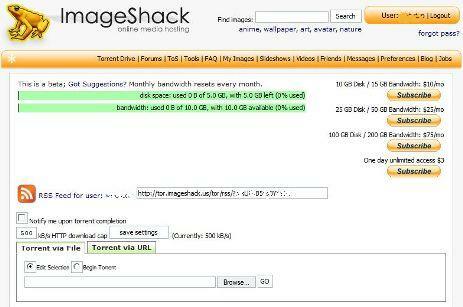 Best of all, ImageShack torrent download service is free. However, the free service is limited to 5GB of disk space and 10GB of download bandwidth limit. If the limit is too low and not enough for you, it’s possible to subscribe (paying a fee) in order to increase the limit to bigger disk storage capacity, bigger bandwidth and higher priority (avoiding the dread “Please try your download later, or go premium for instant priority error”). There is also video preview feature which allows users to browse through stills of the video they are downloading for quick peek into the video content and quality. Download torrent with ImageShack Torrent Drive.